Empowerment Competition; World Citizen Travel Guides are offering five * $1000 bursaries to different hemispheres to reprint the First Worldwide Guide on Crisis Learning - all content is open source, and you can replace articles with more locally relevant guides as you choose. Download Guide here. Debate here. The next collaboration city festival of cafes is New York 007 October 11.
location: 117 McDougal Street which is close to West 3rd Street just South of Washington Park. 11.15 transfers from a cafe production in London's festival last month. Rick's photosynthesis architecture and agriculture inventions open up a world of clean energy and clean food abundance. But they conflict with most existing channels and professional interests. http://www.youtube.com/watch?v=CToYjQFRxXE we believe he's a classic test case of an open source entrepreneurial revolutionary that citizens could network sustainability around - but will we? Rick aims to respond to Taddy Blecher’s request at CIDA Free University (S. Africa) to open source practical peer to peer curricula for sustainability entrepreneurs and wishes to show that photosynthesis architecture around a slum like Kibera would be a 10 times better carbon reinsurance fund than plant a tree. Typical Collaboration Cfaes being hosted by World Citizen Networks Fall 007 - mail info@worldcitizen.tv if you have a production to add or wish to transfer one across cities. Brixton Hub thurs 14 sept: 4.00 pm: why is photosynthesis architecture so hard to popularise as world's simplest way to end climate crises and can London's 2008 Green in City program at South Bank festival hall change this? 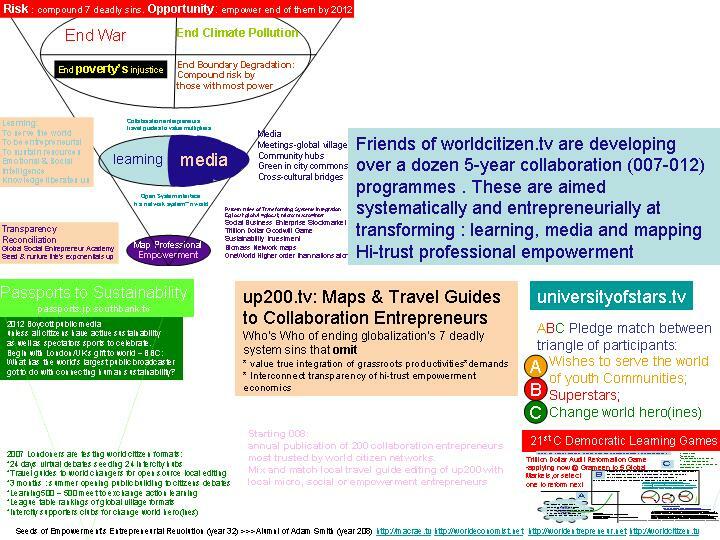 Friends House fri 14 sept 11.45: news from Entrepreneur research on 200 people to most trust networking around for sustainability world 2007-2012 - how to participate! 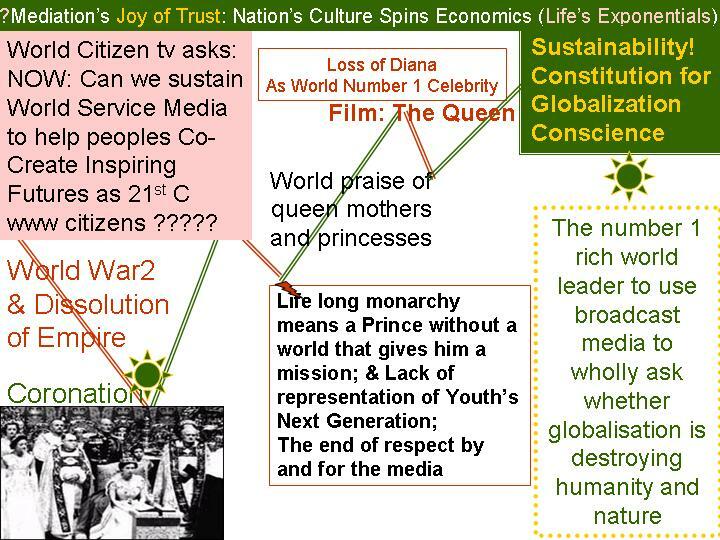 Recently Londoners (the most ranked city and freest village network map befitting a place whose Queen dares to be first to broadcast the sustainability crisis question: is Humanity turning on itself?) in searches through tens of millions of bookmarks on collaboration knowledge city held our 50th collaboration cafe. Collaboration Cafe is designed by alumni of Harrison Owen's Open Space (30 downloads for open space) but who only have 1 hour instead of 3 days to activist communal initiatives. Something has to give compared with open space parameters which in the 3 say format can involve 5000 people (cafes have 15 max), anyone hosting a conversation they believe may resolve the communal crisis the space invited participants to (the main host of a collaboration cafe is an authority that those who decided to come most wanted to litsen to and practice with, ideally become open source alumni of); the invitation phase of the colaboration cafe is give extra dramatic emphasis to try to ensure that the 15 people who most want to come in any social or susttainainability entrepreneur network around London do. We are not saying we have a perfect cafe format yet, but the journey has been an interesting one so far. If you live in another city and feel that you may want to be one of its collaboration cafe hosts, do mail me at chris.macrae@yahoo.co.uk , and I will try and share the practice gudielines we have learnt so far. They have bulit primarily on how do you reduce the principles of Harrison Owen's 3-day open spaces to 1-hour because we believe these have a practical simplicity every meeting format intended to connect all participants can learn from. 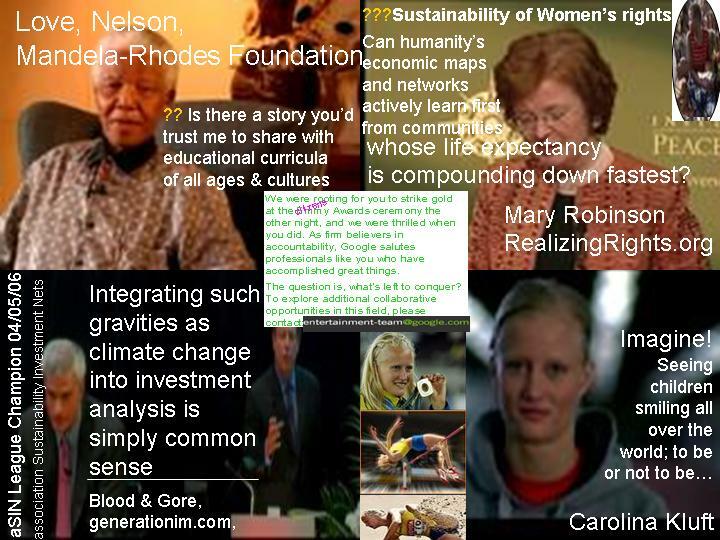 The rest of this page will review some of the questions those who know an alumni of colaboration cafe London are now debating after 50 of the most extraordinary action learning experiences. Here is part of a mail I sent out to the participants of Collaboration Cafe 1-50. 2 Its typically the case that world changers gain naturally from co-promoting each other. A wholly different way to market starting with reality, and where over-bloated imagery of a leader is a disadvantage. 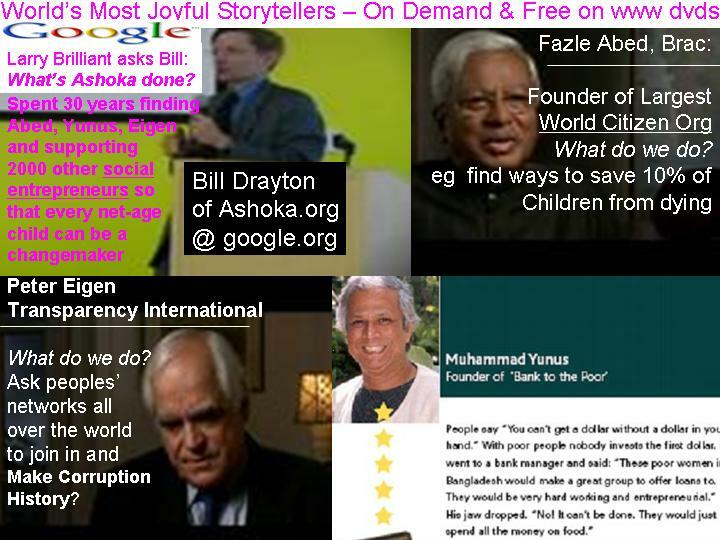 (The goodwill gravities of World Changers like Bill Drayton, Muhammad Yunus, Fazle Aded and Peter Eigen are close to 100% hi-trust reality and 0% puffery). Goodwill markets through hi-trust citizen’s social networks, inspirational stories that turn out to be actionable by the people. So for examples here in London there is a lot of synergy in my view between Muftah’s Omagine and Rick’s Solaroof, or between Tav’s green.tv where local youth movements capture which social networks are celebrating sustainability changes and Sofia ’s co-mentoring of how to connect the disconnected. Is there some 5th networking-savvy colaboration movement that people out of London can develop that could multiply all 4 of the above and then be replicable where other cities want to sustain world changers? Londoners are hugely excited to see how the intercity fan club project of Muhhamd Yunus waves especially as half of the 21st C most imaginative pop duo -TheGreenChildren - is English bred. Hi. Chris: Yesterday I met with Professor Dr Muhammad Yunus at his office in Dhaka. I told him of you. Anyway, I explain my ideas on Yunus Forum. He is pleased with many of my ideas. Now I am on Internship with his office working on this. I want to email all networks asking suggestion and comments and participation. This will also appear on the web. I want you pass my email to all of your networks. Is it possible? Sofia: I will be back to London by July. then i will meet you. Lesley: great to hear about you. keep it up. 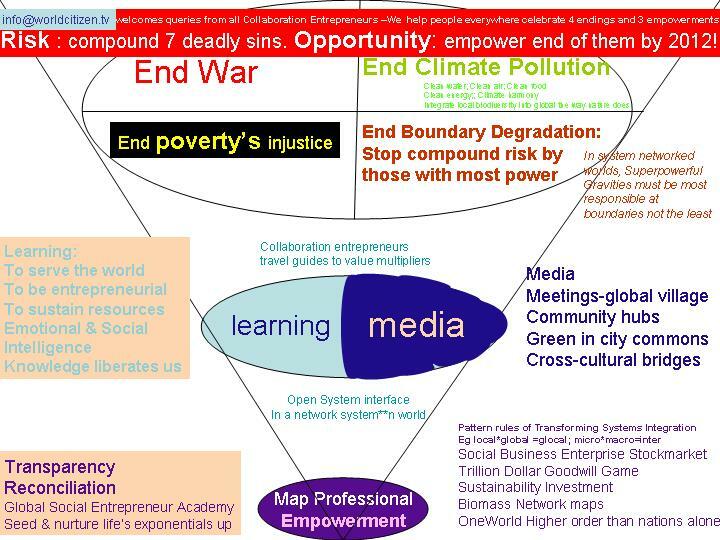 Moreover, respectful cross-cultural collaboration is the 21st C key of the gatesway of the peoples world changer networks- the flows of collaboration gold and the maps of social entrepreneurship. To, prepare for cultural lift-off:: Alfarabi is nominated as the Muslim philosopher-guide whom world citizens might seek first to learn common sense and conscience. 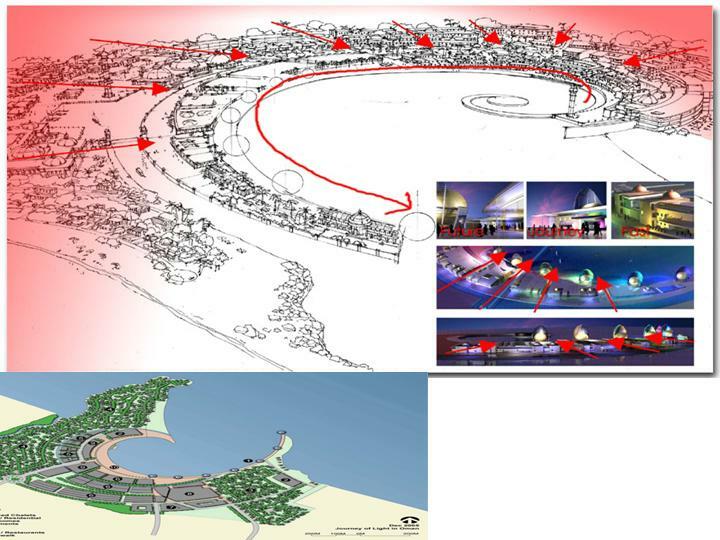 Muftah's SevenStars is a corporation concerned with asking how to rebuild cities in the Middle East that live up to the first millennium's centuries of enlightenment when for example Baghdad was one of the open universities to mankind. After London's Collaboration Cafe 50 - we asked ourselves how could we ever beat that? We have decided that its down to Londoners to develop a 5-year intercitizen round the world programme of meeting: Passports to Sustainability. Huge events are now being prepared for London's Spring Launch including the greenest building ever built for 100 people open space meetings which will appear on the terrace of the Queen Elizabeth Concert Hall, South Bank in time for a Spring Season of sustainability citizens debates. 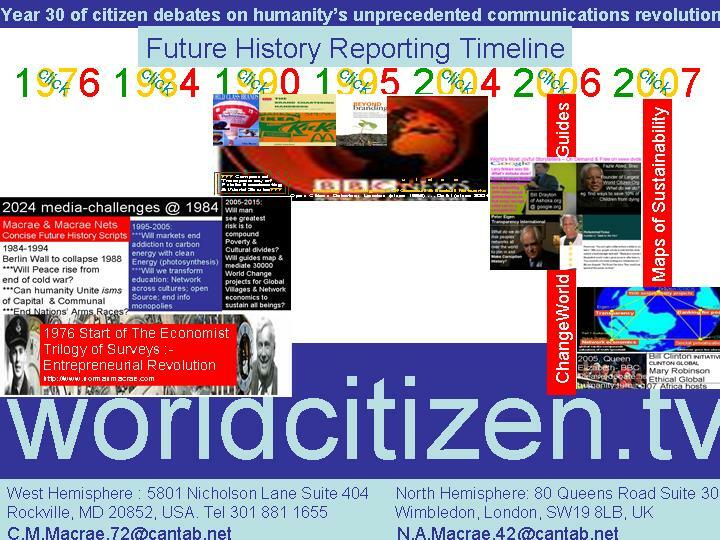 We invite citizens to plug in their calandar of meetings where humanity's biggest Q&A are shared; it is our intent to return in the Spring of 2012 in time to celebrate London's Olympic year with far more cheerleading news for humanity than sport alone can score. 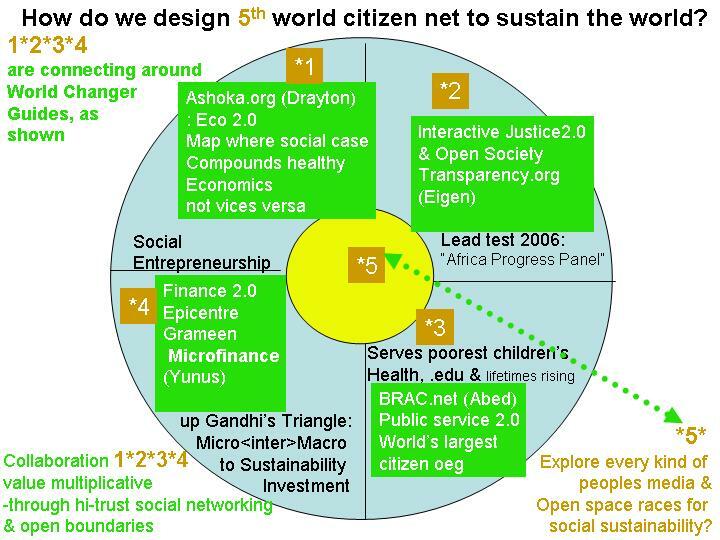 Hopefully the BBC as the world's largest public broadcaster will join in celebrating evry link to good news and sustainability innovations that the round world of citizen meetings explores and plants. 2.1 you get your own sqtest.tv page and your own questions with links to your own web or networks; however if someone comes along and is deeply interested in working on what they believe is the same SQ test, you take the responsibility to discuss with them until you all decide if you are open sourcing the same SQtest theme or different ones; if its different ones that's no problem because that's the stage to refer the person to info@sqtest.tv so they can start up their own page. 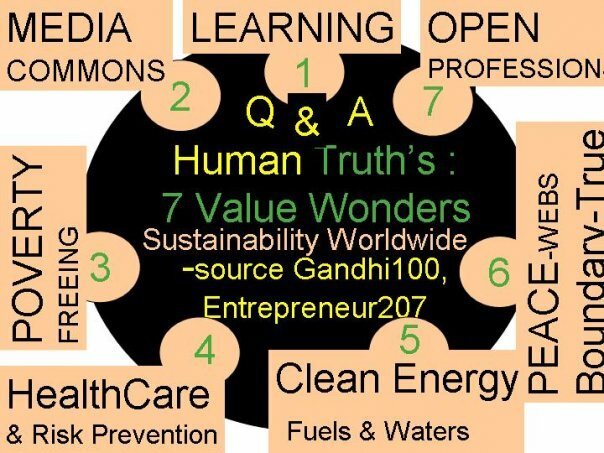 each question gives the person a preference choice between 2 opposites to vote which their common sense feels good in matching future sustainability; part 2 of each question is: in daily life do you find you are ordered or otherwise persuaded to do what your preference selected or the opposite?